Cathedral has the highest church steeple in the world! Ulm is famous for two things: 1) being home to the world’s largest church steeple and 2) being the halfway point between Munich and Stuttgart. It was the latter that motivated me to actually visit Ulm. Instead of just driving by it since I was looking for a half way point to meet up with friends from Stuttgart. I was pleasantly surprised that it offers a lot more than anticipated. Ulm is home to the tallest church steeple in the world measuring 161.53 m (529.95 ft). It dominates the aptly named Münsterplatz and on the foggy day I visited it disappeared into the clouds, making it impossible to see the entire steeple. Entrance to the cathedral is free and while it’s a nice cathedral I wasn’t wowed. Having said that I find after seeing so many churches it takes a lot to wow me. For a small fee visitors can climb the 768 steps up the church steeple, for what I’m sure (hope) would be a spectacular view after climbing all those steps. Our group of four declined against it since it seemed like a lot of work for what was going to be inevitably a view of fog. While I wasn’t blown away by the interior of the church, I did enjoy watching the steeple disappear into the clouds then reveal a bit more of itself, only to cover up again in cloud cover. We enjoyed the views of the cathedral from Münsterplatz over a glass of gluhwein (mulled wine) as we explored our first Christmas market of the year. To warm up we headed to Cafe im Stadthaus, a modern cafe in stark contrast to the cathedral with huge windows that offers great views of the Münster. Bizarre looking Albert Einstein Fountain where Albert Einstein was born. Ulm is the birthplace of Albert Einstein and there is a rather comical fountain that is worth visiting. I’m not sure this is how I would wish to be immortalized, but it is memorable and better than another boring looking statue just standing there. The Crooked Haus (SchiefesHaus) in the Fishermen’s Quarter. Photo courtesy of to.wi on Flickr. The Fishermen’s Quarter lines the River Blau with traditional half-timber houses, cobblestone streets and was home to the fishermen and tanners in previous times. It is also home to the Crooked House (SchiefesHaus), a leaning 16th century house that has been renovated and is now a hotel. 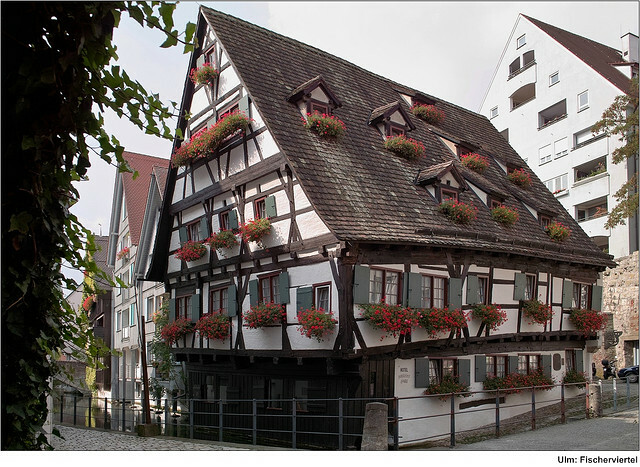 I have seen a lot of half timber houses since moving to Germany, but I never get tired of them and if they have an interesting history, even better. Federal Fortifications were the largest in Germany at their time. Photo courtesy of the City of Ulm. Ulm is home to the Federal Fortifications which were built between 1842 – 1859. Fortress Way (Festungsweg) provides a nice walk along the surviving buildings with signs along the way (in German). The Federal Fortress has more than 800 rooms in its four wings and was the largest fortress in Germany at the time. While it it possible to go inside some of the buildings, it does take some planning. Fort Oberer Kuhberg (Upper Fort Kuhberg) is only open to the public on Sundays only from 2-5pm, with a guided tour on the first Sunday of every month at 2pm. Guided tours are available of Wilheimsburg (William’s Castle) on the third Sunday of every month at 1pm. Display at the Ulm Bread Museum, the largest bread museum in the world! I love quirky museums and the World’s Largest Pig Museum in nearby Stuttgart remains as one of my favorite offbeat museums. I confess that I didn’t have high hopes for the bread museum in Ulm and was going more for the quirky factor, but I was pleasantly surprised. The staff were the most welcoming and friendly staff I’ve ever met at any museum in Germany and self guided tours (in English) were included as part of the very reasonable 3.50 € admission price. The bread museum is home to over 17,000 bread artifacts but as the cashier jokingly assured us “Don’t worry not all the artifacts are on display, many of them are in storage.” It was incredibly informative covering over 6000 years of the history of bread and bread’s significance in Christianity. My favorite part of the museum was the “Bread and Art” section which featured works by Salvatore Dali and other prominent artists that used bread as their subject matter. We were all surprised by how interesting it was and it’s worth a visit. Visitors can also purchase a “8 for 12” Museum Card, which entitles visitors access to 8 museums in Ulm and in Neu-Ulm for 12€ and is good for a year. I confess that while I didn’t have high expectations for my visit, mainly because all I knew about it was the Ulm Cathedral, I was pleasantly surprised. Ulm may not be as charming as Schwaebisch Hall, but it’s a pleasant way to spend a day or at the very least a couple of hours. Some very interesting facts about Ulm. The Münster's steeple disappearing inot the fog must be a magic sight. I always associate Ulm with Albrecht Ludwig Berblinger, the 'taylor of Ulm' an aviation pioneer who constructed a hang glider in 1811 and promptly crashed into the Donau on his first flight attempt..
@Inka - I actually thought the Münster’s steeple disappearing into the fog was beautiful as well, although I still would like to see it on a clear day. I read about Albrecht Ludwig Berblinger but couldn't find anything associated with him in Ulm, but there must be a statue or something of him there that I missed. @Dina - No, I didn't notice the sparrows and I don't the famous Ulm Sparrow story. Do tell, now I'm very curious. Great activity list. I've only been to Ulm, because I took a wrong turn on the Autobahn, but next time I'll definitely make a stop. @Dina - I love that story, but now I'm wondering how I missed the sparrows everywhere. I'm going to have to go back and be on the lookout the next time. Thanks so much for sharing! I like Ulm too and despite having driven past it numerous times, just finally made it there. @Mette - I think that's how a lot of people end up in Ulm, but it's definitely worth a rest stop. @Dina - I tried clicking on the link, but it wouldn't open. Thanks for trying though, I'm very curious and wondering how I missed them. Wow the Ulmer Münster looks amazing, inside and out. Love the Albert Einstein fountain! @Claire - It's beautiful on the outside and nice on the inside. I loved the Albert Einstein fountain as well, it's so quirky. I just learned about the Ulm School that took root after the end of WWII - I'm taking a 20th C Germany Art & Design seminar - and it's great to see such a progressive come out of such a historical town. I remember climbing the Münster and eating pasta somewhere between there and the train station. Otherwise, my experience there is very limited. I do think I need to add it to the list though. That every growing list that would be far more simple and accurate just to be replaced by a small piece of paper with "everywhere". @Ashley - Very cool, you probably know more about it's history than I do. @Andrew - I still need to climb the Muenster, just on a day when it's not cloudy. I like your idea of a list. I find the same thing, especially when you start getting into the lesser known places which I really enjoy. I wouldn't say Ulm was a "must do", but I did enjoy it and think it's worth a stop.